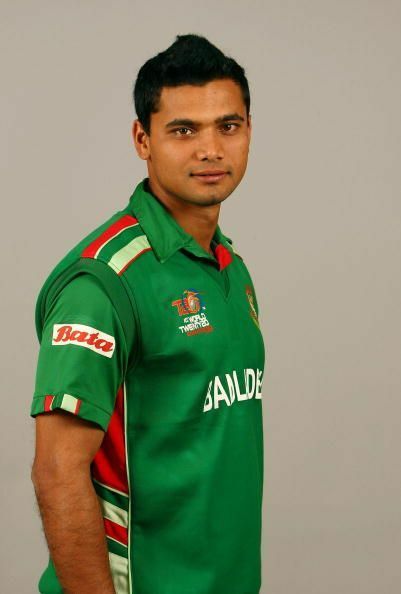 Mashrafe Mortaza is a Bangladesh cricketer and is considered as one of the best bowlers of Bangladesh since their entry into Test cricket in 2000. He is also seen as one of the reasons for his country's steady rise in international cricket. Born in Narail on 5 October 1983, the young lad was famous in his hometown for his style from the very early age, leading to him being dubbed their "Prince of Hearts". He first came to attention during an under-17 regional tournament in 2001, when he bowled fast, slammed sixes and showed some very sharp fielding skills. Andy Roberts, the then Bangladesh’s coach, was impressed and Mortaza was drafted into the Test side which was his debut first-class game as well. Mortaza made his Test and ODI debut against Zimbabwe in the year 2001. He picked up our wickets in the maiden test, while bagged two in the maiden ODI. Mashrafe rose to prominence in 2004, when he claimed the mighty wickets of Virender Sehwag and MS Dhoni and made a valuable 31* at the lower order when Bangladesh defeated India for the first time. In the calendar year of 2006, Mortaza was the world's highest wicket taker in ODIs, collecting 49 wickets, which included his personal best of 6/26. The following year he played an instrumental role in his side's shock victory over India in the 2007 ICC Cricket World Cup, taking 4/38 and was adjudged the Man of the Match. When New Zealand toured Bangladesh in October 2008, Mortaza was part of Bangladesh's maiden ODI victory over the Kiwis as he took 4/44. In 2009, Mashrafe and Nazmul Hossain sunk Sri Lanka to a new low, picking up five wickets for just six runs. In the 2012 Asia Cup, he struggled to bowl his quota of 10 overs due to an injury but finished as Bangladesh's leading seamer with six wickets from four matches. He was named the captain of the Bangladesh team in mid of 2009, during the series against West Indies. The team won the match and eventually the series, but Mashrafe got injured in the first match and remained out of the playing squad throughout the series. He led Bangladesh to a victory against England in the summer of 2010 in Bristol. After the 2015 World Cup, Mashrafe led his team to ODI series wins against Pakistan (3-0) and India (2-1) at home. These results sealed a place for Bangladesh in the 2017 ICC Champions Trophy in England. Mashrafe’s career and injuries went hand in hand. The duration for which he underwent injuries, covers a lion’s share in his career. Be it an important series against Pakistan in 2002 or ICC Champions Trophy in 2006, the speedster missed just because of injuries. Eventually, he decided to remain in the shorter formats of the game, playing his last test in 2009 against West Indies. A capable lower order batsman, who can use the long handle to good effect, Mortaza was picked up by the Indian Premier League franchise Kolkata Knight Riders side for $600,000 in February 2009. In the player auction of the first edition of Bangladesh Premier League, Mortaza was snapped up as a captain by the Dhaka Gladiators for 45,000 USD and did justice to the honor by leading the team to the title win. On 4 April 2017, Mortaza announced his retirement from Twenty20 internationals after Sri Lanka tour. However, he decided to continue to represent the country in the ODIs.